I didn’t really get into avocados until just a few years ago but ever since then I have been hooked. One of my favourite way of enjoying avocados has to be in guacamole as it show cases the avocados beautifully and it is just plain amazing! The base recipe for guacamole is pretty easy and once you have it mastered it is fun to play around with it and I often like to try adding different ingredients to change up the flavour profile a bit. After having both avocado slices and a blue cheese in a sandwich a while ago I had been fantasizing about combining them in a guacamole and on fajita night it was the perfect chance to try it out. I pretty much just took my number one guacamole recipe and added blue cheese which I brought up to room temperature first so that it would more easily mash into the guacamole. In the end I quite enjoyed the blue cheese guacamole! The tangy blue cheese played particularly well with the cool and creamy avocado and added added a hint of flavour that just made everything better. Mash everything to the desired consistency. Oh Kevin you certainly are a Master of anything dipped. I love how you create flavors that are amazing and yet so simple. I love the way you took a sandwich and turned it into guacamole! i'm definitely going to have to try this. This looks interesting. I LOVE guac and I LOOOOOOVE Blue Cheese, putting them together would have to be amazing. That is definitely a wonderful guacamole! What a terrific combo. I love the addition of blue cheese, what a great idea. The blue cheese adds an extra little kick! Avocados and blue cheese go so well together, and this guacamole sounds fantastic! I made your strawberry avocado salsa last night and both my husband and I loved it :). You're kidding! Well, I guess you're not since you blogged about it. I've never had blue cheese in my guac. You might make me a believer yet! that sounds awesome and btw i love your blog! you should also try nigella lawson's recipe for blue cheese guacamole, i think that you would really like it. Two of my most favorite things in food..guacamole and blue cheese. YUM! I've got to try this and I'm sooo glad I've found your blog! Pretty sure this is the best idea EVER!! Hi Kevin! Thanks for stopping by my blog and your nice comment. I love your blog and your photos are sublime. You always have something fun and exciting. Cheers. I love avocados' it makes my body looks younger. Thanks for sharing, I will certainly indulge with it. Hi! I can't wait to make this! It looks great!! I just signed up to follow your site, and I would love for you to check out my blog if you get a chance and maybe even follow me so we could share recipes! Thanks! I loveee avocado and BLUE CHEESE but never thought of having them together! Now you got me thinking. Lovely idea. This is such a great twist on guac! I'm sure that extra tang makes it extra addictive. This look delicious and healthy, can@t wait to try it. Pleased to "happen" upon your blog, Kevin, when I was looking for a Blueberry Zucchini Loaf recipe. Trying my hand with yours today. Thank you. Will be checking back in again on a regular basis I am sure ! LOVE love love this!!!! 2 of my favorite things, in 1 bowl. I love home-made guacamole, it is so much better than store bought varieties and fun to make! I will definitely try this recipe as I love blue cheese as well. you're a crazy man! crazy! Blue cheese – inspired. And gorgeous. My chef was right when he said we eat, first, with our eyes. What a fabulous idea! Can't wait to try this….so creative! OMG!!! 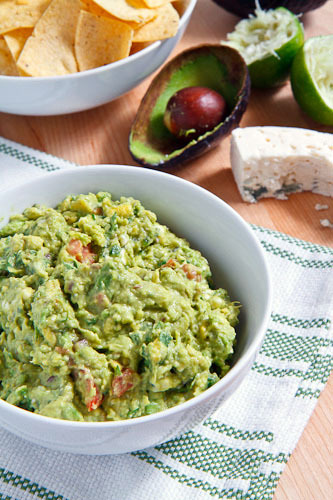 I love guacamole… and I like it basic.. but Blue Cheese Guacamole sounds AMAZING!!! Oh.Yum. Made this for supper & slathered it on a soft grinder roll topped with Sunday's roast beef leftovers,cheddar& caramelized onions. For one, I've never put guacamole on a sandwich before…add the blue cheese & I'll be having it again tomorrow & beyond. Thanks for the continued inspiration. Ha! Just saw a recipe for a guacamole grilled cheese & thought of youuu. This looks absolutely delicious. You have a knack for photographing food. It is an art that most can't do well but you seem to not only be creating some great recipes but also taking some great photos! Thank you for this recipe. I can't wait to try it! This looks delicious, I've tried this with cream cheese but i didn't like it, but blue cheese has good flavour, that it must be delicious! What type of blue cheese did you use? I can't help but think it would make a difference – some blue cheese are a lot stronger than others. JennyLeah: For this I generally go with a milder and creamier blue cheese but if you want a stronger blue cheese flavour you could easily use a stronger blue cheese.